For over two centuries Crown Paints has manufactured paints which offer a trusted means of transforming and protecting environments both indoors and out. Crown Paints offers a range of products for areas where stringent hygiene performance needs to be managed such as hospitals, health centres and kitchen areas. 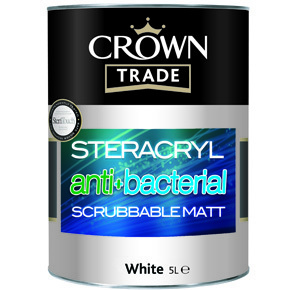 One of the key products for areas operating strict hygiene regimes is Crown Trade’s Steracryl Anti-Bacterial paint. 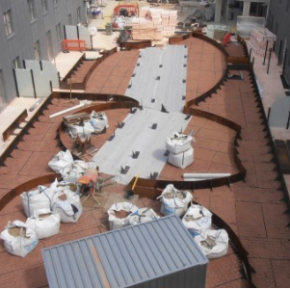 Suitable for a wide-range of areas including the food and health sectors, the coating utilises the natural properties of silver to limit the growth of problem bacteria, including MRSA, Salmonella and E.Coli. 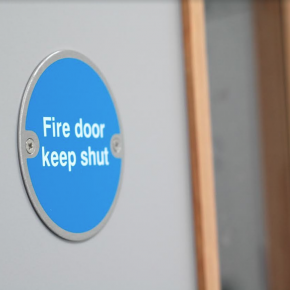 The anti-bacterial paint offers specifiers a choice of scrubbable matt and durable acrylic finishes and an extensive colour palette. It is also highly-durable and capable of withstanding stringent cleaning regimes such as those required by the NHS. The product also offers economic incentives due to its robust, long-lasting formulation which helps extend redecorations schedules. Another factor for specifiers to consider is the potential health effects of mould. 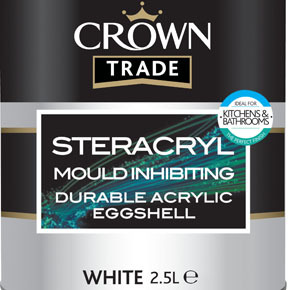 The Crown Trade Steracryl range includes a mould inhibiting version which contains an effective fungicide, specially developed to maintain decorated surfaces by inhibiting the development of mould growth on the paint film. 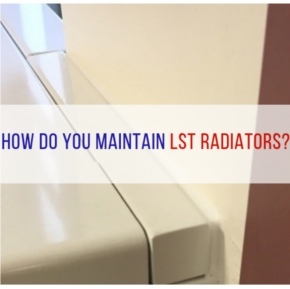 The paint has undergone stringent fungal tests carried out to British Standard BS3900:G6 and the acrylic eggshell system is also washable, making it ideal for use in areas where condensation can lead to mould growth. 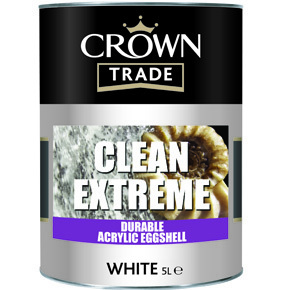 In addition to the Steracryl anti-bacterial and mould inhibiting paints, Crown Trade Clean Extreme offers polished performance in areas of high use – coping with strict cleaning regimes and reducing the need for costly redecoration by minimising wear and tear. 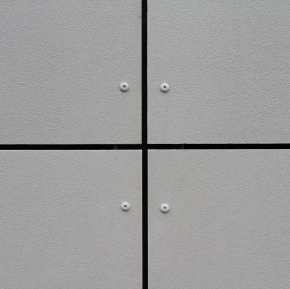 The scrubbable finish ensures a ‘just painted’ appearance is maintained thanks to a special polymer which offers a tough surface film and intrinsic stain resistance. The coating allow stains to be easily wiped away with water. Scrubbing with a cloth will easily get rid of tougher soiling, and for deep-seated stains, scrubbing with a mild detergent will eliminate traces. This leaves Crown Trade Clean Extreme Scrubbable Matt with a sheen-free finish, even after repeated scrubbing with wet or dry cloths.